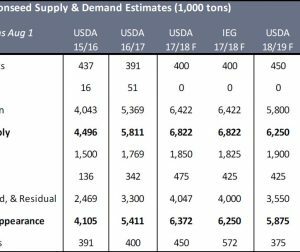 Throughout August, the market focused on the 2018/19 cotton production forecasts, cotton crop conditions and progress, and logistical issues moving cottonseed. USDA released its Crop Production report on August 10, which provided the first forecasts of the season from NASS for corn, grain sorghum, soybeans, rice and cotton. 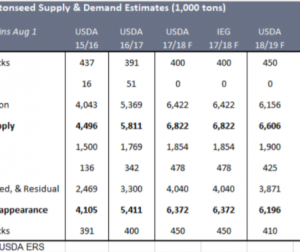 USDA forecast all cotton production at 19.2 million bales, which was an increase from USDA’s July WASDE report at 18.5 million bales causing a few changes to the cottonseed balance sheets. US cotton condition and progress in August featured a few improvements for the cotton crop, but conditions at month’s end remain the lowest since 2011.